President Trump on Thursday issued an executive order to create a task force that will develop recommendations to put the cash-strapped U.S. Postal Service on firmer financial footing, which lawmakers, stakeholders and the agency itself cautiously welcomed while calling on Congress to take more immediate action on solutions that have already been proposed. Trump’s order tapped Office of Personnel Management Director Jeff Pon and Office of Management and Budget Director Mick Mulvaney to take four months to evaluate the Postal Service’s core functions and propose reforms to help put the agency on a better fiscal path. The directive came after Trump has for months criticized USPS for its contracts with Amazon that he deemed overly friendly to the online retail giant. “An open and transparent review process in which the perspectives of all stakeholders are fully represented to develop reform proposals could benefit American businesses and consumers,” the agency stated. USPS said as a more pressing matter, however, Congress should take up bills with bipartisan backing in both chambers that would eliminate many of the burdens causing the agency to post losses of more than $1 billion for 11 consecutive years. Those bills would eliminate the agency’s mandate to prefund future retirees’ health care benefits—lump sum payments on which the Postal Service has defaulted for the last few years—by shifting retirees to Medicare as their primary care provider and amortizing remaining liabilities over the next 40 years. They would provide a permanent boost to USPS prices, potentially reduce the agency’s liability to the Federal Employees Retirement System and allow it to pursue new lines of business. Most postal observers, including key lawmakers, large-scale mailers, employee groups and postal management, believe those steps and others taken in the bill would provide significant, immediate relief to the agency. Before a down year last year, USPS had seen four consecutive years of “controllable” profits, a measure that does not account for losses stemming from the prefunding payments. The House Oversight and Government Reform Committee unanimously approved a reform bill last year, while a similar measure introduced in the Senate in March has yet to receive a vote. “I welcome President Trump’s engagement on this important issue and urge him to provide the leadership that is needed to finally get these reforms over the finish line," said Sen. Tom Carper, D-Del., author of the Senate bill and Congress' top advocate for postal reform. "What we don’t need, though, is to waste more time studying a problem that we already know exists. 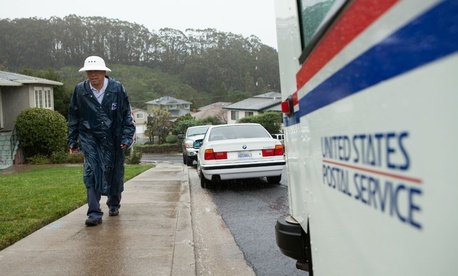 We know that the Postal Service’s financial situation is in a downward spiral. We know we need to act now." President Trump’s own budget, released in February, contained USPS reform proposals similar to those being considered by Congress. Trump also suggested reforming postal employees’ benefits packages and reducing mail delivery from six days to five in certain cases. Art Sackler, manager of the Coalition for a 21st Century Postal Service, a group made up of large-scale mailers such as Amazon, the Association for Postal Commerce and the National Newspaper Association, said the best impact of Trump’s order could be the added attention it brings to the dire nature of USPS’ finances. “We’re hoping the additional attention will spur more action with these bills,” Sackler said, adding the measures would “do a fair amount to enhance the Postal Service’s financial stability and mitigate liabilities.” He was hopeful the task force could help identify long-term to fixes to the Postal Service beyond what the current bills before Congress address, but expressed doubt the agency heads on the panel would have the time to address those issues in just 120 days. Stephen Kearney, executive director of the Alliance of Nonprofit Mailers, similarly voiced support for the Senate bill but said it was a “step in the right direction” rather than a comprehensive fix. While he welcomed the task force as a means to take that wider approach, he was skeptical any suggestions they make would result in any action. Sackler expressed an openness to reviewing the Postal Service’s mandate to provide universal service, but said only minor tweaks should be considered. An elimination or major revision of that obligation, he said, would hurt businesses, citizens and the agency. “There really is only one entity that is capable of delivering to so many rural places, or difficult to get to urban places, and that’s the Postal Service,” Sackler said.